Hello everyone, I trust all is well out there in translation land! As some of you may have spotted, last week marked the occasion of the second international postgraduate conference in translation and interpreting studies at Queen’s University in Belfast. 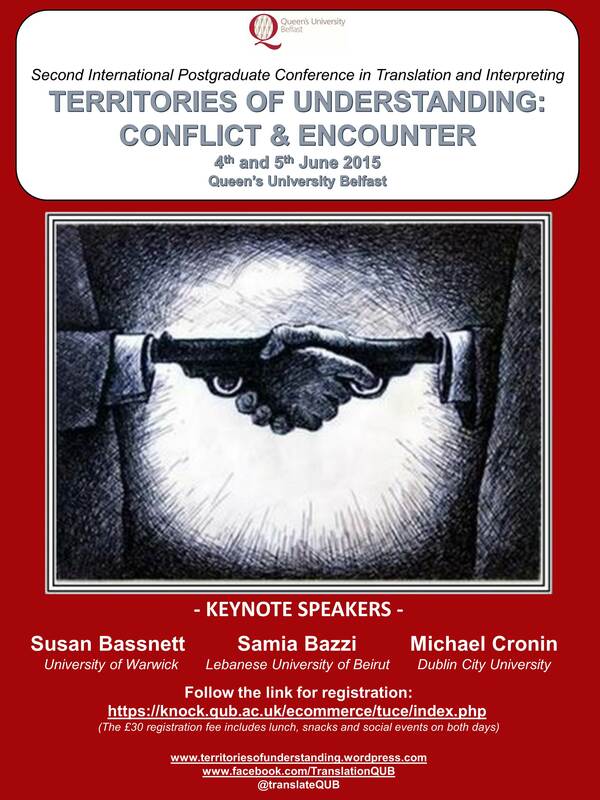 Entitled Territories of Understanding: Conflict & Encounter, the organisers put on a thoroughly enjoyable event and I wanted to share a few quick thoughts that emerged during my stay in Northern Ireland. Spread out over the course of two days, the conference’s twenty or so papers were slotted around keynote talks from leading translation studies scholars Susan Bassnett, Michael Cronin and Samia Bazzi. While these big-name talks all provided ample food for thought (as you’d expect), reflecting the breadth of research in contemporary translation studies and showcasing what the (inter)discipline’s well-established scholars have to offer, there was much more to the conference than the chance to hear from a few translation heavyweights. This was the first time I’d attended a specifically postgraduate conference and I was blown away as translation’s emerging scholars were provided with the leading voice. Talks were consistently excellent throughout, tackling a vast array of topics while centring around the notion of conflict and encounter, and the whole event was characterised by a universal willingness to share and discuss ideas. Indeed, beyond enjoying two intense days of translation talk (what’s not to like about that, right?! ), it was this postgraduate basis that really set the event apart. Having seen first-hand what this new generation has to offer, I left Belfast with no doubt that there is a bright future in store for translation studies. Back in the present, one of the most pressing general issues facing current and future translation scholars alike (and something that is also a real concern in the translation profession) is the need to move beyond our own borders and demonstrate the complexity and relevance of translation to a wider audience. As our ongoing preoccupation with expanding understandings of translation continues to take the area beyond traditional notions of a specifically linguistic activity, translation studies’ interdisciplinary appeal is becoming increasingly evident. While such tightly focused conferences can often represent a case of preaching to the converted, talking up the merits of a subject to an audience of fully fledged enthusiasts, the range of high quality talks on offer from people based outside of translation studies demonstrated that this push beyond our borders is gathering increasing pace and garnering tangible results within the academic world. Talks centring around discussions of politics, tourism and art seamlessly blended in alongside more traditional discussions of corpus linguistics and rhetoric and the conference gave a strong sense of the progress that has been made over the last few years. But this expansion must also be accompanied by a note of caution. While these widening understandings of what translation can entail undoubtedly allow us greater scope in engaging with other fields, it seems that an already limited focus on using theory to inform the core practice of translation may be slipping further from our attention. Aside from a few papers that did explore concrete examples of translation issues, direct concerns from translation and interpreting professionals were only briefly discussed during a round table discussion at the very end of the conference – a clear indication of the way in which such concerns are all too often relegated to the sidelines. Our core focus (which, for me at least, is that of translation as an interlingual transfer operation going from a source text to a target text) is becoming increasingly diluted and the acceptance of more abstract notions of translation, which are so powerful in extending a welcoming hand to neighboring disciplines, perhaps sees us running the risk of becoming disconnected with an important element of our discipline’s goal. That all-important sense of real-world applicability remains in danger of drifting out of sight – a concern that is not new but is well-worth reiterating. Ultimately, however, my enduring impression of the conference is undoubtedly that of the considerable quality and the strong sense of direction within the young translation studies community. As the only translation studies PhD student at my university, it was great to get a real sense of what is happening in the wider community. What’s more, my enjoyment of the talks and the discussions that followed really confirmed that, one year into my translation research, I’m definitely working in the right area!